I have started to see my Roses (aka students of various mediums) regurgitating the same information back to others, implementing it into their own work, and actively shielding against it! “Well”, I said to myself, “If you keep saying this so much, perhaps it is you that needs the talisman.” So I set to work making some! If you have ever visited my home and paid close attention, you will see various sizes shapes and placements of different evil eye talisman, including a dinner plate sized one that faces the front door. With the recent move to Portland, we have put much of our stuff in storage while we find our forever home. With the exception of the dinner plate evil eye and one other small glass eye, they are all packed away. Recently I have begun to wear a wonderful glass eye ring that was bought in the Istanbul Grand Bazaar years ago by a wonderful and very talented dance student of mine from Japan and so I thought it was time to write about protecting yourself from the evil eye with different types of talismans, including designs made with henna on the skin, and reversing the effects via two older spells from England. In the end, we will discuss how to use water to help cleanse your body of these negative energies, but first a little history and cultural information! The curse of the evil eye is a cross cultural belief that has a deep and culturally diverse background that ranges from protection and incorporation in henna designs to reversing the effects of the curse. Now, let’s explore protecting yourself from the evil eye with a talisman, reversing the effects via a spell recorded by Charles Godfrey Leland and lastly how to make water to help cleanse your body of these energies, but first a little history and cultural information! The evil eye curse, or a malevolent stare, which does produce curse energy can easily be reversed and protected against using a talisman or other methods. It is believed in, used, and actively protected against in countries such as Brazil, Spain, Portugal, India, Italy, Greece, Morocco, Africa, The UK, Turkey, and most of the Arabic speaking countries. It is present in Folk beliefs of the Berbers, Witchcraft, Islam and Judaism, and is even mentioned in Greek, Roman and Biblical texts. The Evil Eye, simply put, is a jealous or evil gaze from someone who is envious. This belief is so wide that it is hard to ignore! In fact, there is quite a bit of weight to the belief. The Evil Eye is a curse; it is often unconsciously projected from a jealous person to the victim who is typically the one they are jealous of. It is the same exact thing as the “stink eye”. We’ve all done it and we all have even had it done to us! It is when this “stink eye” is projected onto the recipient over and over that a curse takes hold. It is important to note that most often, when people feel they are truly cursed (rather than just unbalanced paranoia) it comes from the evil eye. There are those rare times when an actual Witch sends a malevolent curse to another practitioner or person; however those seem to be the exception and not the rule. These take much more to undo than the evil eye curse. However, the evil eye or a malevolent stare, which does produce curse energy, can easily be reversed and protected against. There is a long folk history of using spit to help reverse the effects of an ill placed glare or compliment on a child, however the most common evil eye talisman are usually a blue glass eye, seen below, is often used to protect against this evil glare. The classic evil eye motif that most of us are familiar with uses 4 layers of blue and white to create the bull’s eye design. Other designs include the hamsa or Hand of Fatima containing an eye or eye motif and five fingers, sea horses and the very popular Peacock eye or the eye of a peacock’s feather. The hamsa is both a protection amulet and a symbol of God. It can be traced back all the way to Mesopotamia, but is used by Arabic and Berber cultures to protect against the evil eye. Specifically it is a right or a symmetrical five fingered hand that is created with the eye motif in the center to help protect from, reverse, or ward off the malevolent glare of others. In addition, raising the right hand with the fingers slightly apart can help to break or stop the curse. Today it is sold on jewelry, wall hangings and in henna art as both protection and luck bringing. I have been working with evil eyes since I first started learning belly dance in the very early 2000s. One of the most important things about learning something new is to show its culture proper respect. To do this, I immersed myself in the Middle Eastern Dance culture. After art school my interest in henna began to grow and I began to study different aspects of henna culture and again a very important thing about being a henna artist is knowing the right design to place on the right client. What is culturally acceptable in India may not be in the Middle East and the designs will be much different than those in Morocco and the Sudan. In Morocco and Turkey, the use of a realistic eye is often incorporated into henna, jewelry and other artistic designs, but in other countries these types of symbols are forbidden. In Morocco women use henna and/or tattoo around their ears, nose, eyes, and mouth to protect from the evil eye or a malevolent spirit. In addition, Moroccan Henna art specifically uses the eye, or eye like designs featured below, in their henna designs to ward off the evil eye. However the evil eye is not exclusive to the Eastern cultures, Europe and the UK have a long history of magic and folklore surrounding the evil eye curse. In Europe, we see that water plays a large factor in helping to both protect and reverse the effects of the evil eye. In England, a sea horse is often used as a protection against the evil eye. In Scotland “silvered water” was often used by a Faery doctor to cure the curse of the evil eye. “Silvered water was water into which silver coins had dropped; and it was prepared in a special way.” (McArthur. 119) The water was taken from a liminal place and the silver dropped in the water. After which the one afflicted with the curse would drink 3 sips of the water and then the faery doctor would sprinkle the rest around the person while reciting incantations, perhaps like the one below, thus the person was healed of the evil eyes curse. If you choose to perform a similar spell you may choose to add a bit of your own spit as both a means of curing the curse and as a taglock. Another such way to cure the curse of the evil eye is outlined by Charles Godfrey Leland below. However, you can simmer the mixture down and bottle what is left in a jar with sacred or holy water, be sure to seal it tight and place it close to where you spend most of your time. You may choose to use a blue jar or even paint one with an evil eye. Or you can add a small portion of the liquid mixture into a seahorse bottle like below. If this is too complicated, and you prefer to simply work with water, you can make an evil Eye reversing water by adding special items to prepare and charge your water with the effects of evil eye reversal. Evil eyes (now) look on thee. May they soon extinguished be! In the fire of God!" May they soon dissolved be! *Use “thee” when working for a friend or loved one and “me” when working for yourself. and work in a similar fashion as I have outlined here. You can buy glass evil eye beads online and they do very well if they are charged properly, but there is no reason to break the bank or even wait for a paycheck and shipping because you can start your own collection now by making your own. I happen to also believe that the more you put into something the stronger it is, so if you buy one be sure to charge it well. I am a big fan of natural fibers, but I also am a dancer, so I love just a tiny bit of metallic fibers as well! I chose to use the fibers to “trap” the energy. I selected the traditional blue and white bulls eye pattern, and 3 sticks rather than 2 sticks when creating the “gods eye” I chose three because of the 3 colors used, and to align myself with the magical number 9 which is a theme that runs in Avalonian lore and the 9 maidens, 9 waves, 9 priestess etc. After I finished making these, I took them to the Pacific Ocean and performed a ritual to cleanse, consecrate and bring life it to these protective talismans. It is important to note that really anything that resembles an eye can be employed in the same fashion; snail shells, cowrie shells and other eye like stones will have similar results. To dispose of them you can burn flammable talisman, bury glass or other talisman that cannot be disposed of in fire or cast them into the ocean. Please note to only send shells, stones and other natural talisman back into the ocean. Do not pollute our land or ocean! Belief in the evil eye, while not a worldwide belief does spans multiple cultures and countries. Each country has its own belief system that is similar but different surrounding this curse. From the traditional bull’s eye and mystical Hamsa to spit, water and a few coals, many Witches and folk healers have been working with this curse, successfully breaking it and restoring ones energy back to normal. Much of the lore about the evil eye is about actively protecting yourself before it takes hold. Don’t wait till you think you have received this malevolent glare, grab your tools and start crafting! Choose your method based on what resonates with you and don’t forget to charge your talisman with intent! to visit the etsy shop and buy one of your own blessed in the waters of the Pacific Ocean! Here is a little Sea Spell for Prosperity! Recently a fellow Witch sent me a box which contained many watery things, there were shells, feathers, mermaid's purse(s) and other things. With the arrival of the new mermaid's purse, I decided to use some of my smaller ones for some magic! A Mermaid's purse is shark and/or sting ray egg pouches. They are also called Devil's purses which hints at its powerful nature. You can find them on the shore of almost any beach. They are usually found by the surf mixed in with washed up seaweed. Using the casing that once held a baby string ray or shark that was birthed into the sea for spell work is incredibly powerful. They are also the perfect vessel for magic that involves growth, prosperity, birth, and renewal. I recently came across the Janarric Runes. Raven Grimassi has written about them. He believes that they are runes used by Witches in an Italian coastal town. So, in a way they are associated with the sea and water witchcraft. I decided to use three of the runes in bind rune fashion. I worked them together until I was happy. The result is below. I had just picked up some new paint and decided to use it on the egg pouch. I also wrote my spell on paper and placed it inside the pouch. Once the paper was safely inside, and the paint dry, I said my incantations and finished my spell. The mermaid's purse speaks of birth, growth renewal, and bounty, these energies along with the fierceness of the animal, the sigil, the spell, and symbolism of the egg pouch. All these combine together with the spoken incantations, makes one power packed charm! Below are some helpful hints so you can make your own. Find a hatched mermaid purse on a near by beach. Clean it up and let it dry. Prepare your sigil and intent. Paint or draw it on. Prepare your spell and any incantations you may have. Whisper your incantations and then seal it by anointing it with sea water and leave on the altar until it is finished. 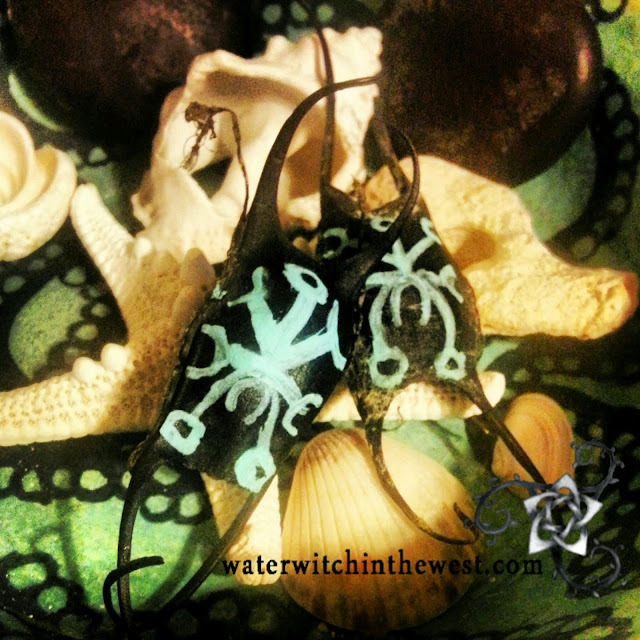 Also Mermaids purse's and various sigils can be used in protection charms as well. Using the egg pouch to call upon the spirits associated with these powerful animals.